to observing the Moon, comprehensive Moon maps with labeled features, and information on observing the four brightest planets: Venus, Mars, Jupiter and Saturn. 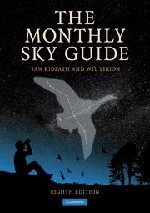 This eighth edition of Ian Ridpath and Wil Tirion's famous guide will appeal to astronomers of all ages. This book contains a chapter for every month, describing the prominent stars, constellations, star clusters, nebulae and galaxies that are visible. The 50 clear and easy-to-use maps provide a simple introduction to the skies of the northern hemisphere. Most of the sights are visible to the naked eye, and all are within reach of binoculars or a small telescope.